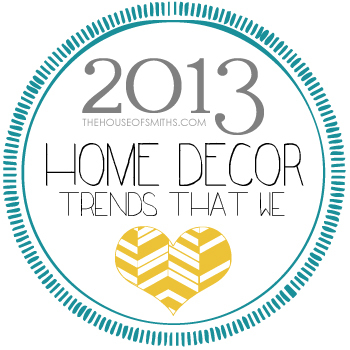 This past month I've been thinking a lot about a few of the 2013 trends that we have embraced and used in our home this year. From gold accents and unique shades of blues, to bold wallpaper and funky little ceramic animals. Most things that sound a bit odd at first, but in the right settings and amounts can look really awesome with lots of different styles and in almost any space. 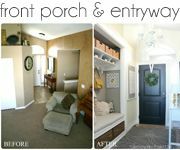 We already wrote about and shared a couple of trends that we love in our latest Homes.com article and it was so fun, that I thought I'd share a few more item suggestions for each of our additional favorite 2013 trends, and also examples of how we've implemented them in our own home! Today, we're starting with Gorgeous Gold. 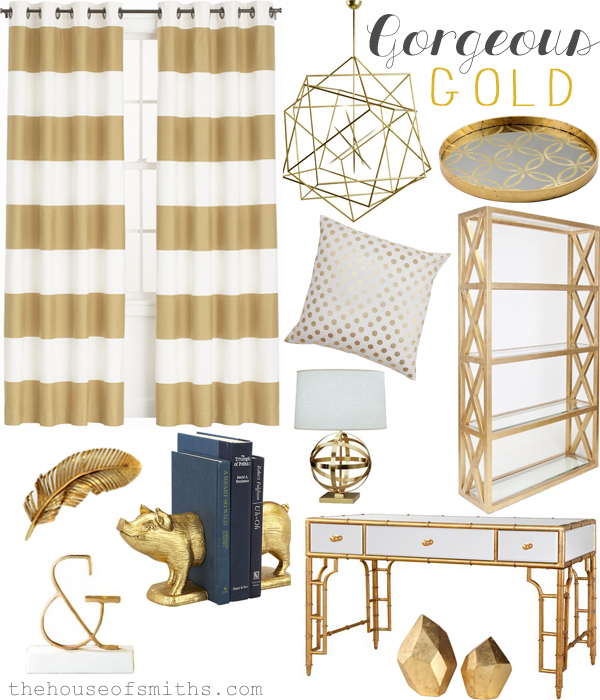 If you haven't noticed (how could you not) I'm a bit obsessed with all things gold right now. There's just something about throwing a flash of warm metallic in a room that makes it seem classy and interesting. Isn't it funny how gold has come back around? The fun and different thing about 2013's gold trend, is that it can vary quite a lot. You can find decor accents that are more of a brighter yellow gold... or those that are a deeper, brassier color. 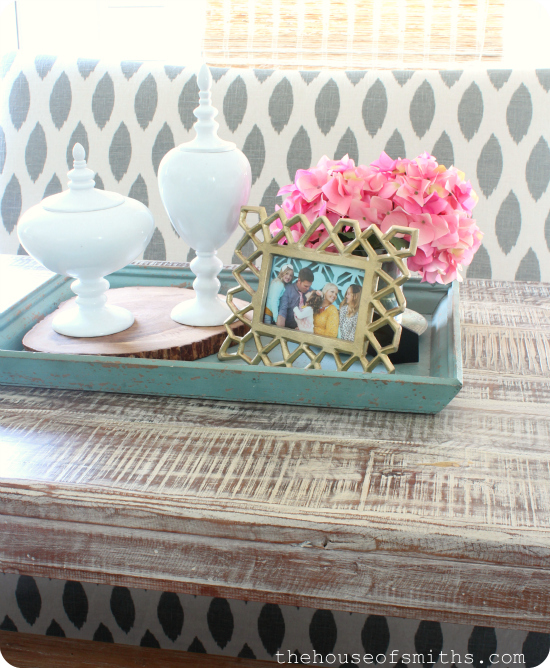 What this means, is that depending on your existing decor, you can definitely discover a fun table, vase, or decorative accent that works best for you. 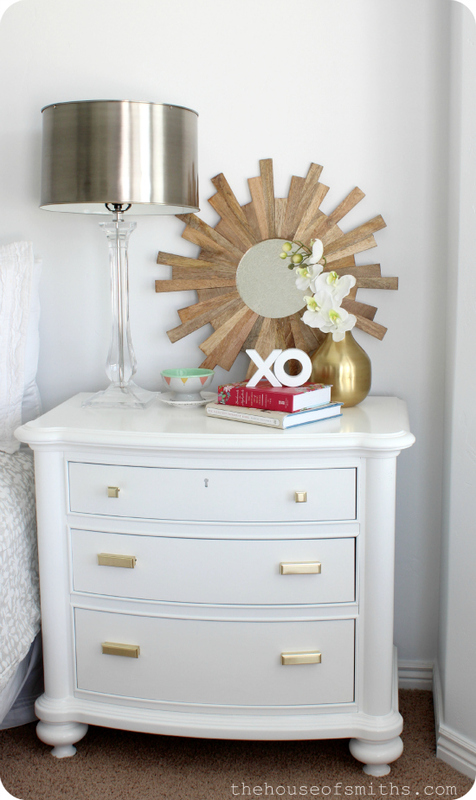 Not all gold accents are created equal, in shade, quality or finish - so, to each their own! Gold seems to bring in a bit of romance to a space, so I thought it would be fun to try out gold hardware on our new revamped nightstands in our master bedroom... and the gold vase on the tabletop just helps tie everything together. 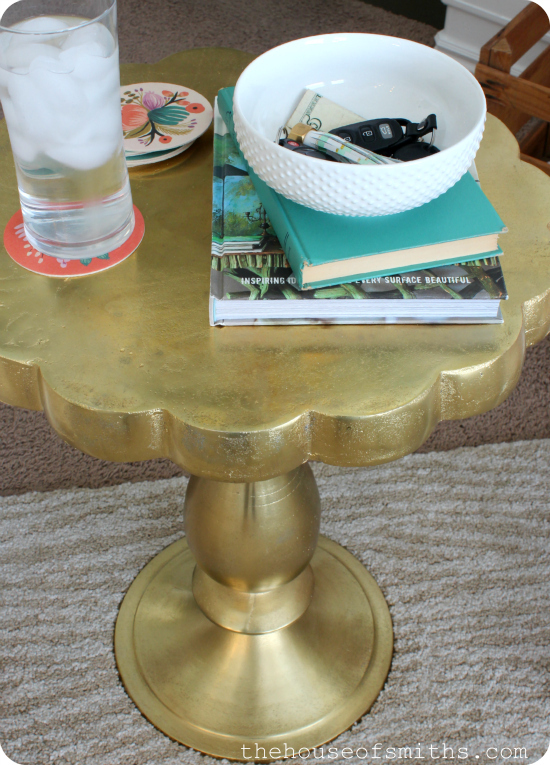 This small, scalloped, gold side table from ZGallerie caught my eye a few months ago, and I knew it would look perfect between my two sitting chairs up in the living room. It's great for holding keys or perfect for having a place to set a drink. This geometric frame from Target was one of my first gold purchases, and I still love it! It's a great non-committal piece and can be moved from room to room easily to mix in with any other existing decor or decorative displays you may already have. Last but not least, I couldn't help but include the very shiny, metallic, wonderfulness in front of me right now as I type... this adorable gold Pouf I ordered off of Joss & Main a few weeks back. Now that we have Cason's huge piano in this room, it's almost impossible to have much of a coffee table in here. That being said, we still love to lounge and hang out in this space, so propping your feet up is a must. I also really like to work in here, plopped on the couch because it's the happiest, sunniest spot in the house. I was a little nervous to order one of these trendy Pouf's at first, because I thought they might be too squishy or weak, but really, mine is super sturdy and has held up great. It's also nice because you can move it around the room depending on where you need it. I know a handful of you voiced your opinions on how you felt about this returning gold trend when we posted about the hardware on our nightstands earlier, but what does everyone else think? Do you like the hints of gold & brass showing up in home decor again? Would you incorporate some of these warmer metallics into your space, and if so... how? The gold looks nice in your home. However I still tend to cringe at gold (I'm looking at you brass knobs on my MIL's kitchen). So adorable! Such a chic piece that is timeless too! i love gold! i've always loved buying vintage and second-hand, so i've often had some here and there, but love that i can find it almost anywhere now! i've had some faux bamboo brass tables for a while, but just got a brass bar cart for my indoor plants that i am loving! 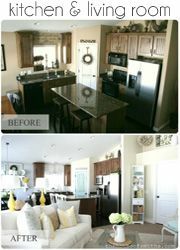 you can see them both here: http://www.themakerista.com/2013/07/the-living-and-dining-spaces.html?showComment=1374579665049 thanks for sharing, shelley! I think it is fun to see all the ways that gold is popping up in home accessories right now. I like your golden pouf. Love the gold accents! Love your style! Can i just ask where the two small facet sculptures in the lower right corner of the first picture are from? I like the small touches, like the knobs and frames, maybe even a lamp base, things that could change easy if I got tired of them. I must say that I love gold and brass! 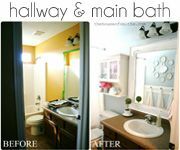 Even when everyone else was hating on it, I stubbornly refused to change my light fixtures, hinges and door knobs! glad to see that I am ahead of a trend for a change! But does this mean that instead of enjoying the low price on this nontrendy stuff now I am in for a mark up! Oh no! It's funny because I have always been the girl that said "I HATE Gold" (picture a growly angry voice)... and I am growing to love it. 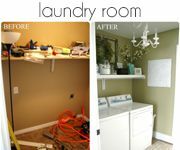 Never thought I'd say that but I am even (gasp) going to start incorporating it in to my own home! Love all your Gold touches!! I am just tired of how quickly the color of metals seems to change to "what's" popular right now. I have "mixed my metals" for years and will continue to do so, regardless of what's popular. I just can't keep up with the House Fashion Divas :) My doorknobs, light fixtures are all gold or bronze-toned, and kitchen cupboard knobs/handles are black, while the light fixture in there is silver. I figure I use what I like regardless of the "hot" styles. Isn't that what making it your home is all about? 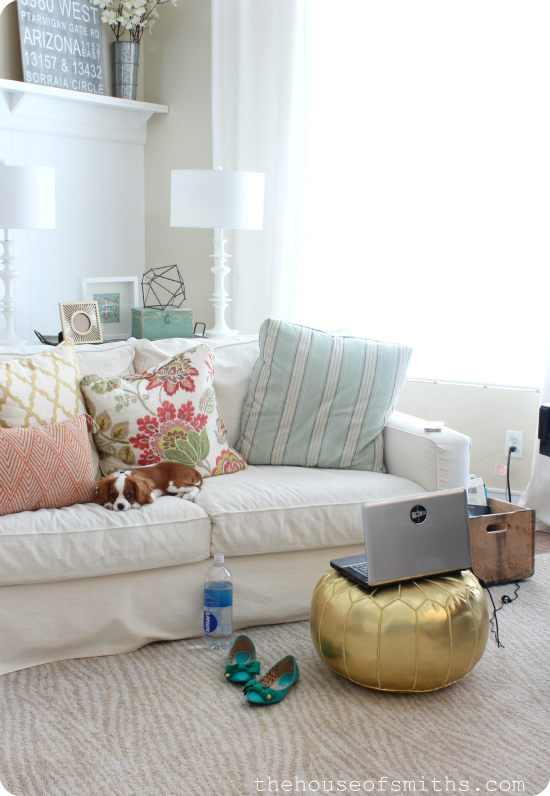 Looks like your puppy has settled in, and loving the life of a couch potato. So cute! We just brought our new puppy home also, at 9 weeks of age. She has her eyes on my sofa as well! I wonder how long I will last with those eyes staring at me. I'm just as much in love with gold as you are! Where did you get that silver metallic lampshade on the lamp on your revamped dresser?? I know this post is about gold, but that metallic lampshade is awesome!!! I was glad to see your gold pouf. I was thinking about using a metallic one - probably silver and wasn't sure if it would work in place of a coffee table. I think mine would need to be bigger but definitely seriously considering it now. Thanks! Ack! Is that a geometric chandelier in your mood board?? In love! I don't see it referenced in your links. Do you know where it's from? Where is the silver and glass lamp from ? I love it? Gorgeous collection of gold! I love it! Thanks for the inspiration. Where is the gold pendant from? Where is your zebra striped rug from? I have lots of silver currently in my home. Would you recommend replacing it or just adding the gold in. 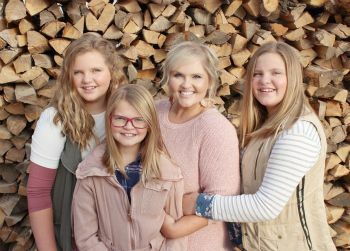 I'm loving the gold after reading your blog! I have gone through 4 can of rustoleum metallic gold spray paint to tranform items throughout my home (picture frames, vases, knick knacks). Can you please tell me where the gold and white striped curtain panels in your mood board are from? Thanks! I like the way you have added Gold to your home. However, I have never liked gold. Even if it is "in" I don't think it is right for my home. That is how I look at trends. What is right for me? The bold blues on the other hand are right up my alley. I have noticed that gold is trending big time. I really love how you have used it. Sometimes people go a little crazy and over use it in the wrong way. For me...I am just not feeling the gold bug right now. Oh, I just love Joss & Main. I have a whole list of things I would love to purchase from them. love your touches of gold! i just had a pink and gold themed birthday party! loving the gold trend! who cares if gold is just a trend it an always be changed! love this look! Where did the tone on tone rug come from?? Omg such a beautiful ideas and work! loved it!~ <3!